There are very few essentials in life, things we need to stay alive. Food. Sleep. Air. So what if you can’t get past one of the first essentials – food? Surely it can’t be that difficult to ensure our children acquire this ‘need’ regularly? Well, based on the conversations I’ve been having with many parents lately – IT IS. Breakfast time can drag on causing the household to run late. Dinner can be a way of stringing out the inevitable bedtime. Not to mention the complaints about the food on offer! Meals can put stress on parents’ time, patience and finances. It can cause dread in the lead up to meals, during eating and following up with endless ‘HURRY UP!’s. So how can we ease the stress of this so called ‘essential’ activity? 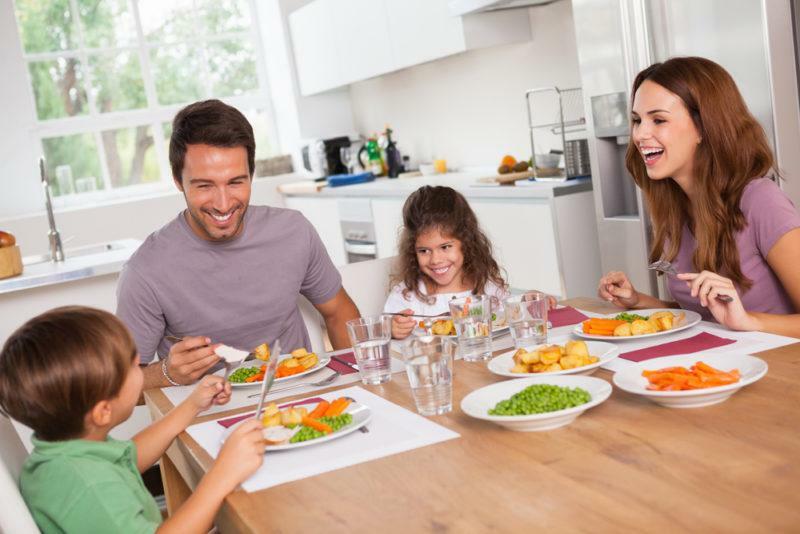 Here are 5 tips to improve the quality of mealtimes in your house. Whether it’s breakfast, lunch or dinner, there are ways to ensure everyone gets heard and acknowledged and we maintain control and confidence in our parenting abilities. Try not to label your kids as types of eaters. If you cast a role of ‘fussy’ and tell other people this in their earshot, chances are they will see this as permission to be fussy. It’s the self-fulfilling prophecy – if you say so, then I guess I am. Instead focus on using description and address each meal with fresh eyes, avoiding terms such as ‘you always’ or ‘you never’. Don’t allow your emotions to take over. By taking some adjectives out of sentences it allows us to remain objective and descriptive. Compare the difference between these two sentences… “How long does it take you to eat your dinner? You are so slow and fussy! I’m tired of always waiting for you to finish” AND “Your plate is still full and it’s almost time for a bath”. The first sentence is long winded, opinionated and emotive. Sentence two is objective, direct and does not cast blame or accusations. Try not to focus on undesirable behaviour. The more attention you give to silly, defiant and antisocial behaviours, the more they are likely to continue. Instead, try the method of distraction. Talk about your day, your favourite movie, your dream holiday… whatever it takes to remove the attention from their rattling behaviours. Not only does this method reduce frustrations, but it provides beautiful bonding time for you and your children. As recommended in step one, praise the desirable behaviours the minute you observe them! And try not to hover and focus on negative behaviours… chances are you will begin to get aggravated and your child will enjoy pushing your buttons! Raising children and running a household is not easy! Especially with added pressures of work, partners and other responsibilities. However the more positive an experience you can make meal times, the more cooperative your children will become.